We are committed to creating a positive, respectful, and safe environment for all athletes. We strive to help each athlete persevere through challenges and meet their personal goals in a constructive manner. If you have any questions or concerns, please contact us via email. 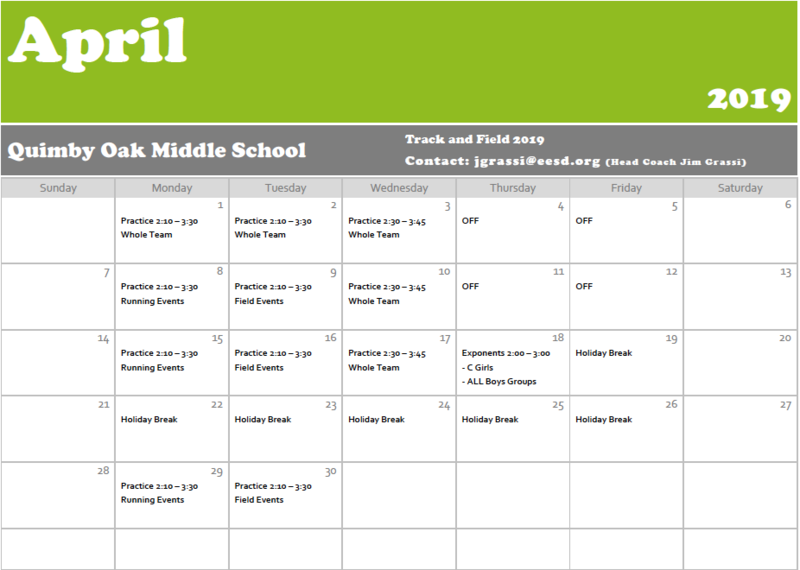 Register online for the 2019 Quimby Oak Track & Field season. Registration closes Wednesday, April 3 at 11 p.m.
Tryouts for the 2019 season begin Monday, April 1. Meet on the blacktop outside the locker rooms at 2:10 p.m. Practice for tryouts ends at 3:30 p.m.
Practices are Monday/Tuesday 2:30 p.m. - 3:30 p.m. and Wednesday 2:30 - 3:45 p.m. Students need to be picked up by 3:45 p.m Monday/Tuesday and on Wednesdays 4 p.m. at the latest. All meets begin at 3:30 p.m. 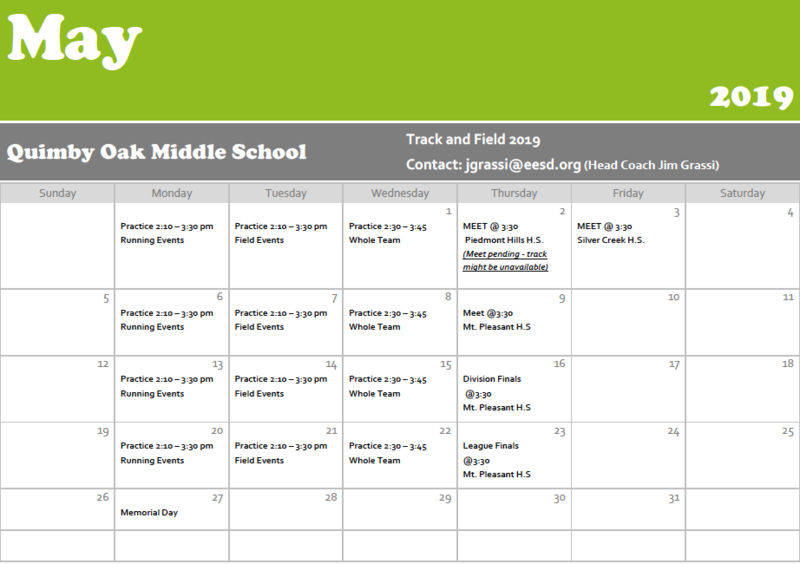 Practice takes place Monday-Wednesday from 2:30-3:45 p.m. Daily attendance is required to be on the team. Two tardies and/or unexcused absences will result in removal from the team. If you have an appointment or other excused reason to miss practice, you must notify your attendance coach during the school day (preferably at lunchtime). If you have an excused absence from school, show your attendance coach your re-admit slip the day you return to school. Academic reasons or extracurricular activities are NOT valid excuses to miss practice. Failure to be picked up at the end of practice -- make sure your ride is on time! Practice ends at 3:30 Monday/Tuesday and at on Thursday at 3:45 p.m. Students need to be picked up by 3:45 p.m Monday/Tuesday and on Wednesdays 4 p.m. at the latest.